Larimar is a gemstone that was discovered only in 1974 and it can be found only in the Dominican Republic (in the Caribbean Sea). It was first found in 1916, but because of little knowledge, it wasn’t paid attention to, and the discovery was delayed. Given how useful Larimar is especially now, during the period of transition, there is no wondering that it has become attainable for the mankind. It is a gemstone that will help mankind move from egocentric consciousness to a new, open consciousness. It is helpful for those who constantly claim that things are not how they should be, and it shows them how to live in the present moment and love what you have right now. Larimar has also been called the stone of Atlantis, because Edgar Cayce (“The Sleeping Prophet”) has claimed that part of Atlantis will be found in the Caribbean. He also indicated that on one of those islands, a blue stone with magical healing abilities will be found. Many believe that he was talking about Larimar and that is why it is also called the stone of Atlantis. Larimar is a crystal that beams love and peace. It relieves stress and cures stress-related diseases. Larimar is a water element stone, but since it is has been born from volcanic activity, it unites the elements of water and fire. It calms emotions, anger and fear, helps the body and soul cope with new vibrations, and helps to contact the angels. 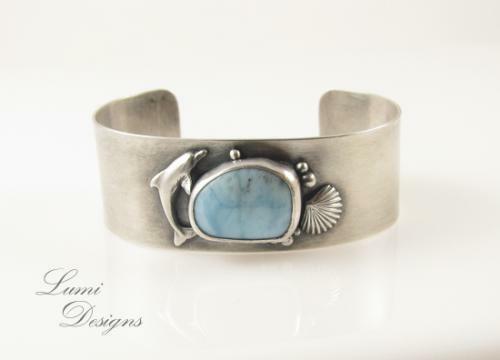 Larimar is in contact with the Goddess energies of Sea and Sky, and therefore helps a woman who wears it to be in touch with her natural femininity. It is a great crystal for pregnant women and after pregnancy, helping to avoid post-partum depression and helping to adjust to the new role. It also helps both men and women get in touch with their feminine and intuitive side. Larimar is very useful for the throat chakra. It is especially recommended for singers since it protects the throat.